It would be hard to argue that any serious jazz collection would be complete lacking an album by the late, legendary trumpeter/flugelhornist Clark Terry. The question, then, is which album? 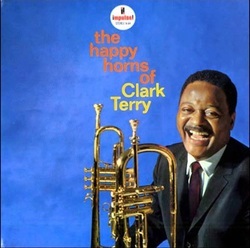 For me, that was a fairly easy choice, and a personal one: I went to my record collection and pulled out the first of several Clark Terry albums I’d collected over the years, The Happy Horns of Clark Terry. It was recorded in 1964, and I bought it new. The group led here by Terry is a sextet, a little big band, really. Having spent many years in big bands—first that of Count Basie, then of Duke Ellington (an experience he referred to later as the “University of Ellingtonia”), and later as a member of the Tonight Show band—Clark brings a kind of big-band sensibility to this combo, which is reflected in his arrangements. Listen for big band-isms like ensemble sections that separate individual solos. Listen too for Ellington’s influence in Clark’s personnel choices for the album: individuals with unique, unmistakable voices who, like Clark himself, can be identified within the first two bars. Here’s the legendary Ben Webster, himself an Ellington alumnus, flaunting his characteristic airy, breathy, fast-vibrato sound. Phil Woods plays his usual ebullient alto saxophone, but with a rare treat added: We get to hear Phil doubling on clarinet. On piano is a young Roger Kellaway, whose wonderfully distinctive, rollicking style is balanced by his great taste and restraint, making him a great fit for the group. Jazz giant Milt Hinton plays bass, and the always tasteful Walter Perkins is the drummer. Never disappointing, Clark puts on a display of his bubbling virtuosity as he rolls out his full arsenal of smears, slurs, screeches and more. Nice, varied playlist on the album, too, including an exuberant version of “Rockin' in Rhythm,” a nice arrangement of Bix Beiderbecke‘s classic “In a Mist,” a Duke Ellington medley, an essentially flugelhorn-and-drums duet on “Return to Swahili," and a Johnny Hodges tune, “Impulsive,” that features Woods’s clarinet playing. This is a wonderfully accessible album, one a non-fan of jazz can enjoy. At the same time, this music will bring a smile to the face of even the most astute listeners. To put it in the vernacular, if you don’t like this one, you don’t like fried chicken.